Play is changing. How Evergreen is facilitating outdoor play, loose-parts play and connection with nature. Finding a spot next to the Children’s Garden at Evergreen Brick Works, we sat down with Cam Collyer, Executive Director of Programs at Evergreen. As children ran by, we spoke about how play is changing and how Evergreen’s programming is responding. The Children’s Garden is an example of this. Ten years ago, the Evergreen team created a children’s program that evolved from experimentation in design and programming. The team knew they wanted to create a day camp that wasn’t an island experience but something that allowed the kids to connect with the city beyond the camp and in a place that they could return to during the school year. At the time, Collyer felt they were on the verge of something exciting. He and the team saw an opportunity to create a special place in the city where kids could connect with nature in the context of indoor, city culture; and that was a departure from conventional playgrounds. “The Children’s Garden is a lab for us. We were looking for insight into design, insight into programming, insights from our audience about what they were drawn to and how they responded to the elements that we were creating,” says Collyer. 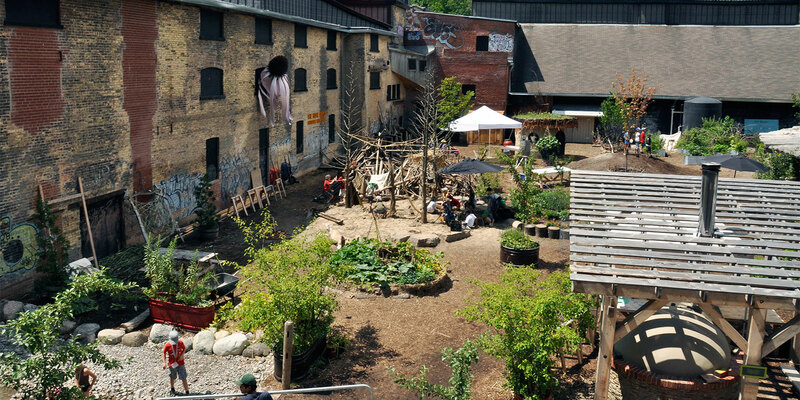 The Children's Garden has become such a beloved space at Evergreen Brick Works that improvements are planned for the fall. 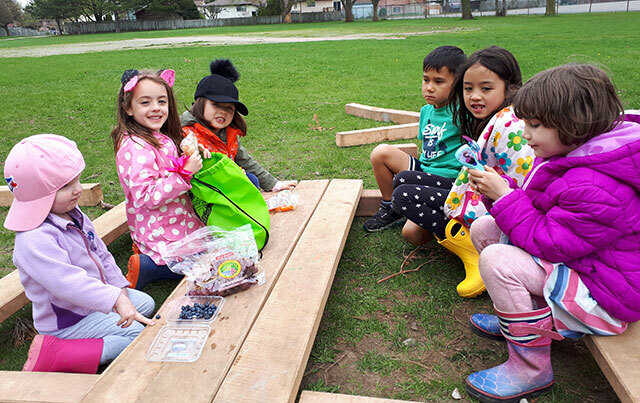 Using these lessons, Evergreen now works with communities like Kitchener and Vaughan to revitalize green spaces and create neighbourhood nature play programs. A pillar of this programming includes loose-parts introduced to the kids by a Playworker, an adult who both encourages and supports self-directed play on site. Loose-parts are movable elements and in this case, primarily natural objects that children manipulate, build and create with driven by their imaginations. The natural play elements can be found year-round, whether they be snow, ice, fallen leaves or dried grasses. The provocation could be as simple as a pile of snow. This multi-sensory outdoor play is good for young minds and helps with both gross and fine motor skills, but the outcome also produces an emotional response to nature. Evergreen’s play programming embraces risk. It isn’t a courtship with danger, but a recognition that risk is inherent and important because it drives learning and builds a confidence in a child’s skills and abilities. Resilience is an important outcome of this approach as it embraces the ebb and flow of the small challenges and successes that are a normal in everyday play. A year ago, the International School Grounds Alliance (ISGA), of which Evergreen is a founding member, released The Risk in Play and Learning Declaration, a statement outlining how risk-taking opportunities are an integral component of a well-functioning school ground and essential for healthy child development. A key observation from our playwork in public spaces to date is that Playworkers need to connect with parents. Parents are struggling to manage screen time as well as their own anxieties about giving their kids independence in their play.